The start of a new calendar year makes me eager to start a hundred new projects. My brain is bursting with ideas. But first, I’m finding energy to finish old things…books I’d made my way partly through, knitting and sewing projects I’d started, little jobs around the house that have sat, undone, waiting for attention. I think it’s something about my desire to start a bunch of new things and realizing that my lists already have things on them and feeling like making new lists and pretending the old lists don’t exist is somehow dishonest. In the interest of being TRUE, I’m trying to whittle down my stash a bit and finish some old projects and books before I jump headlong into the new ones I really want to be doing. So, I’m using some yarn I bought a few years ago from this farm to make a quick cowl. Working with this yarn is heaven! I wish now that I had bought so much more of it. I love the weight, the feel of it- it’s spongy and springy and has the perfect amount of twist so it never splits. The little variations in color are so beautiful, too. 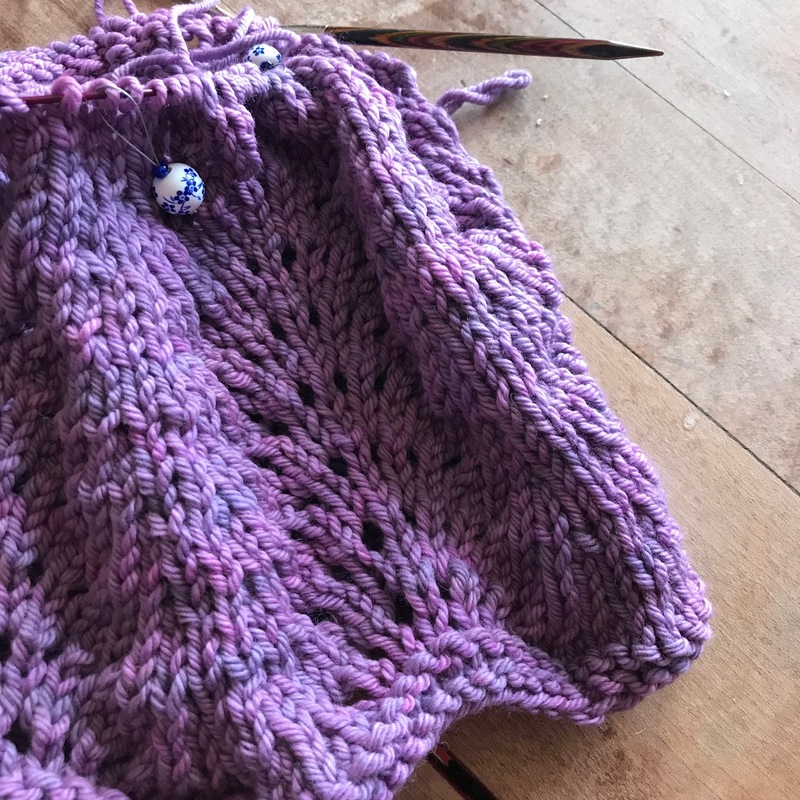 The pattern is Sweeping Angels Neck Cowl by Ivy Brambles (Ravelry link)…and the worsted weight is working up really quickly. 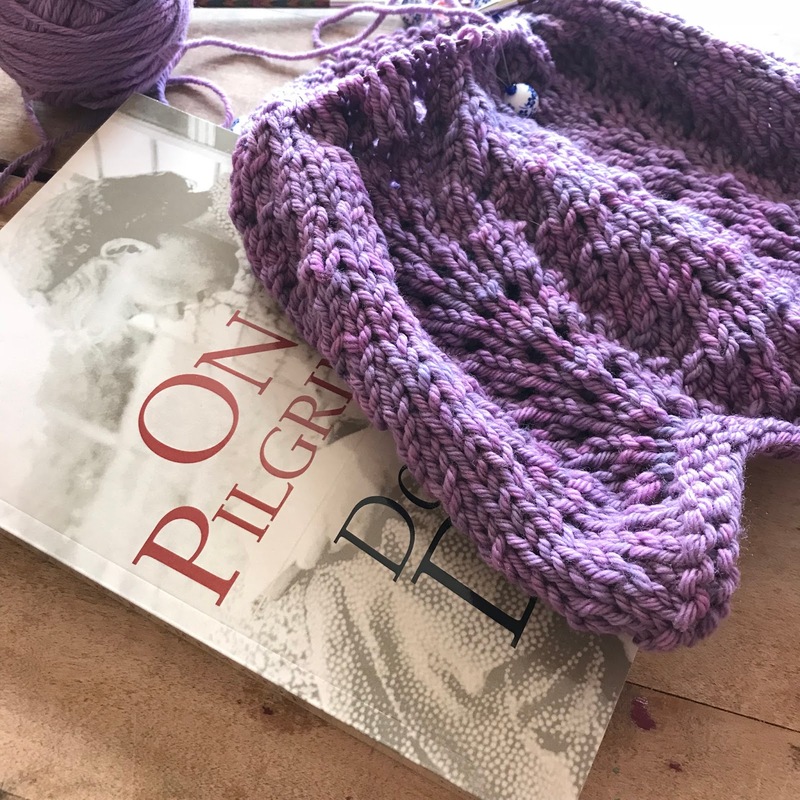 I’m hoping to finish it this weekend, because my yarn is coming for the Big Life Goal project I’m going to finish this year…and I really want to be able to start on it right away! More on that next week, I hope. We are reading On Pilgrimage by Dorothy Day for our Well-Read Mom group, and I’m really finding a lot that connects with how my life feels right now. It seems Dorothy Day and I both like to ruminate on a broad range of things while we wash dishes, clean clothes, and care for people’s needs…and her thoughts are elevating mine these days. She’s all about the holy moments in the middle of the everyday ones, which y’all know is a favorite theme of mine. I’m also working my way through The World’s First Love: Mary, Mother of God by Fulton Sheen and finding it jaw-droppingly amazing. I’ve never read any Sheen before (although I’ve always meant to) and he is wonderful. This book is Smart, Occasionally Snarky, the stuff of Light Bulbs Illuminating Inside My Brain every few pages- I really love it, but I can only take a few pages at a time or my head will explode. In addition to finishing a few books this week, I’ve decided a few other books are not worth finishing right now and have put them aside. I never used to do this, ever, but my friend Katherine has persuaded me that a busy mama’s reading time is precious and that there is no shame in ditching a book if I really don’t like it or it isn’t speaking to me at a particular moment. I can always go back for them later, right? What are you reading? I’m still making my To-Read list for this year, and I’m open to suggestions- I like everything! Linking up with Ginny Sheller’s Yarn Along…I’m so glad to see it back again as a monthly linkup. I’m not sure if I should really call you Gordon. Maybe Mr. Taylor would be more respectful. After all, you are probably older than I am, since during your life you both acquired and sold off your beautifully-bound copy of Wuthering Heights. 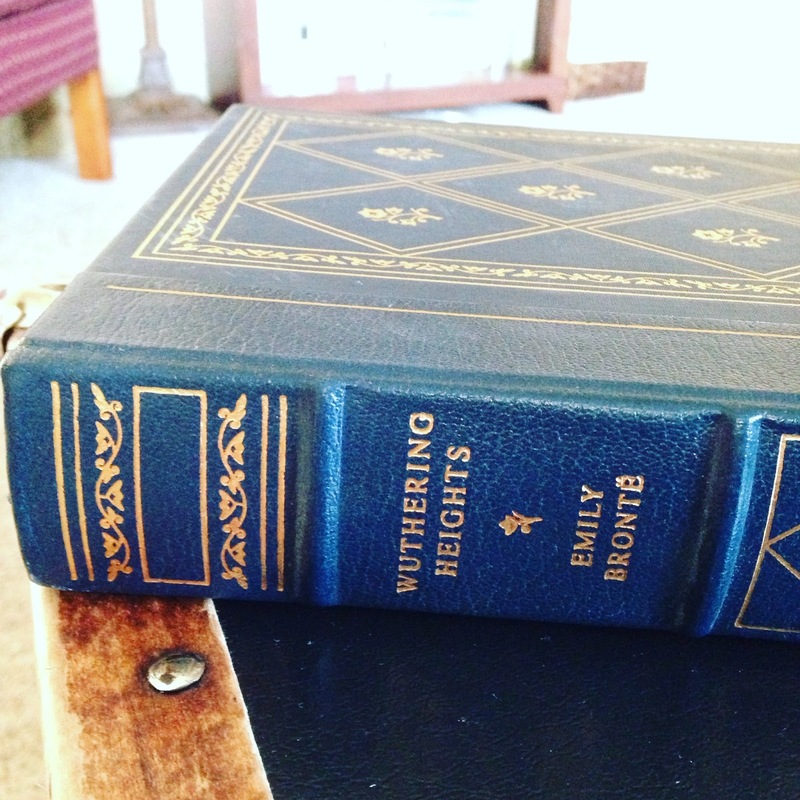 Since I am holding your Wuthering Heights, you are not holding it any longer. Why? What separates my life from yours…why am I in the habit of acquiring lovely books for my library while you are parting from the ones that once comprised yours? Did you ever even read this book? If you did, you held it gingerly, barely opening the covers to be sure you wouldn’t put any pressure on the spine, the way my old friend Colleen does, wanting to ensure that her beloved books are always perfectly preserved. I searched the pages for telltale signs- your notes (not a one), a crease (no such thing), a stray pencil mark (no pencil has ever touched this book). Nothing gave you away until page 259, where I found a single, solitary crumb, maybe from some long-ago cookie. It left a tiny grease spot on the thick cream-colored page when I brushed it off. It might have once been oatmeal. I wonder- do you like raisins or chocolate chips in your oatmeal cookies? And do you think a person needs to choose one or the other, or can someone really appreciate both? Wuthering Heights might not turn out to be the best book I read this year. I might not love it. I read it once before, in high school, and I remember almost nothing about it except the names of the characters and the windswept Yorkshire moors. I can’t predict whether I will love this book enough to read it again and again as I have some of my others. I just don’t know yet. What I do know is that I am very much enjoying holding your book, and that even if I don’t enjoy it, I will keep it for a long time. When I buy books, I like to buy used ones, and I always buy the very nicest copy I can find. And so, just like that, we are connected, and I’m wondering about you- about this bond we now share, about whether you were a fan of British literature in general or just added this one to your shelf because it was the next in the series. Was this a gift from your grandmother, who always hoped you’d be a reader? Did you have children who borrowed it from the shelf to set up risers for their toys to have a concert or to build steps for a castle, the way I used to do with my dad’s never-opened collection of Harvard Classics? Whatever the situation, I’m grateful to have your book now that you no longer need it. I promise to give it a good home. For now, it will be living on the table at the end of my sofa or on the one beside my bed as I make my way through it and get reacquainted with Heathcliff and Catherine. After that, it will live on the second shelf of my living room bookcase, snug beside Pride and Prejudice on one side and Jane Eyre on the other. I think it’s important for sisters to be together, and besides, the divide between fans of Austen and the Brontes has been grossly exaggerated, don’t you agree? I tend toward Austen over Bronte, although I reject the need to make such a silly choice at all. Come to think of it, I would definitely put raisins in oatmeal cookies if I had no chocolate chips. Thanks for the book, Mr. Taylor. I hope this note finds you happy and at peace, wherever you might be. A few years ago, when I was a chronically sleep-deprived mother of a preschooler and toddler twins, I decided to start a chapter of Well-Read Mom in my living room. It seems like a questionable decision brought on by too few hours of consecutive sleep (not unlike when I put the ketchup bottle in the dishwasher or when I machine washed and dried my favorite wool sweater). According to lots of people who know me (and everyone doesn’t know me but sees me at Costco), my hands are full. I don’t have time to start a book club. Maybe, just maybe, I could join a book club that someone else started (probably not, though, because I wouldn’t have time to keep up with the reading). That’s why I love Well-Read Mom. Since Marcie Stokman and her team have done so much of the work of choosing the books, preparing great materials to foster understanding and support discussion, and even sending out monthly audio introductions to play at our meetings, I really just have to make some snacks, clean the bathroom, and open the door for everyone to come in. I also have to read the books, of course…and I’m so glad I have a reason to do that. Well-Read Mom only has one rule: you come even if you haven’t finished the book, and you don’t apologize. This isn’t a guilty book club that shames people if they got busy and couldn’t finish something. We have all been there. It can be a real challenge to fit our own reading into life with small children. What’s the worst-case scenario, though? 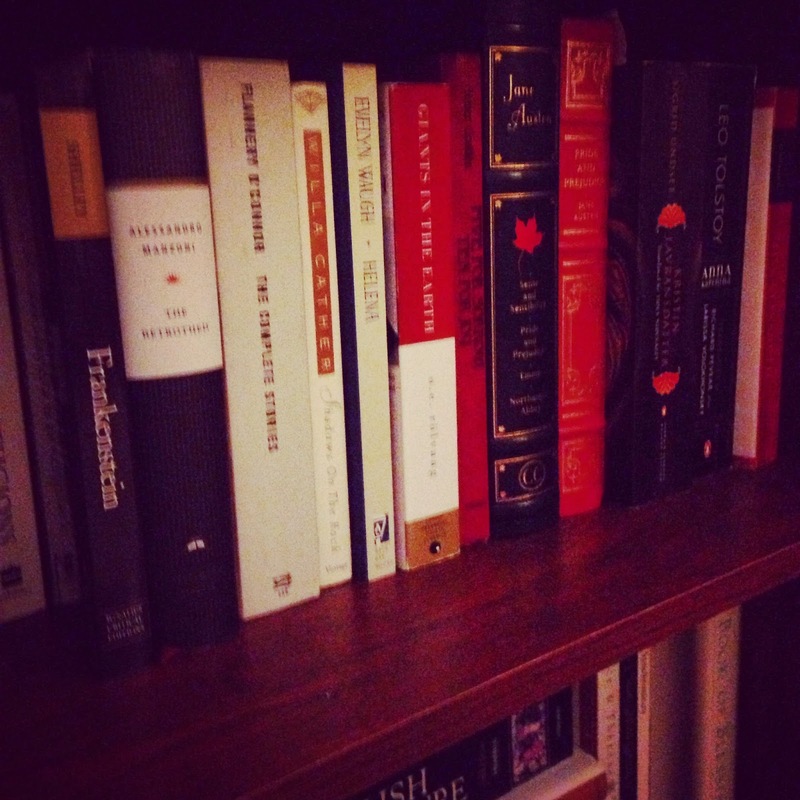 What if we don’t finish The Odyssey or The Brothers Karamazov? Any amount of The Odyssey or The Brothers Karamazov that we read is more than we would have read otherwise. Any little bit of wisdom we glean from that book is more than we had before. The goal of the group is to read more and to read well…and that’s exactly what we’re doing, even if we only make it through a few pages. This group is my first real book club. My prior experience was limited to discussing Junior Great Books in the fourth grade, where we had to use popsicle sticks to keep track of how many times each person had spoken during the discussion. I’m not sure what I thought it would be like, but this group has completely exceeded any expectations I had. We are reading things that matter- books that have shaped our culture and our faith and our civilization. The conversations we have had over these books stretch us beyond the limits of what is in front of us. They put us in touch with the past and the future, with different cultures and eras in which women have struggled as mothers, sisters, daughters, and friends. Some of their struggles look a lot like ours. Some look very different. Some of these fictional characters have become my mental companions. I think about them as I would friends- pondering what they’d do in a situation, or remembering something wise they have said. This definitely makes me a book nerd, but I’ve always been a book nerd. The nicest thing about being grown up with a book club is that I don’t have to apologize for that any more. My mental landscape is dotted with prairie sod houses and Russian tenements and hobbit holes and French Canadian villages and the people who occupy them. I’m so grateful to have found a little tribe of people who are also this way and who will talk with me about what we read together. We don’t just talk about books, of course, but we do always talk about books. Amazingly, when you discuss great books over a long period of time with interesting people, you get to know the people as well as the books. Literature’s themes have always been life’s themes- love, suffering, loss, grief, community. Discussing these themes in characters’ lives broadens our view of them in our lives…and the intersection of life and literature is a great place to start or grow a friendship. Before this group began meeting, if my husband had told me he would take our kids out one afternoon each month for two hours so I could do whatever I wanted, I would not have chosen “host a book club” as my number one option. I could sleep, or get a pedicure, or go for a run by myself, or eat ice cream on the porch, or any number of other things. Today, though, book club is one of the high points of my month. Most of us knew each other when we began, but my Well-Read Mom buddies have become my closest friends. It takes commitment to read a great work of literature and discuss it, and we are committed to each other. Time is precious (and always feels in short supply), but I have never regretted the time spent reading and discussing a great book with these women. Could a book club for moms change the world one reader at a time? I think that’s exactly what is happening. It’s not just a way to spend my limited free time. It is a way to improve my life. It makes me a better, more thoughtful person. When I’m a better, more thoughtful person, I am a better, more thoughtful mother, and my children can only benefit from that. I’m not sure that “better mothering through book clubs” is a thing yet, but if it’s not, it has to be on the rise, thanks in large part to Well-Read Mom. By the way, this isn’t a sponsored post. I’m just sharing with you because I love my book club. I also love you. I also love the reading list for this coming year at Well-Read Mom (Tolstoy! Tolkien! Hawthorne! C.S. Lewis!). If you’re thinking about joining but have questions, please feel free to ask. If you’re on the fence about registering, go for it…you can get free shipping on your membership materials if you use the coupon code justdoit through October 1. I hope you join us. Even if you don’t end up starting a book club, I’d love to chat with you about what you’re reading this year. And if you find yourself mentally conversing with Hobbits while you saute the veggies for your chicken curry, you’re in good company here. Kindred spirits.